I quickly discovered that in the world of camera bags, there is no one perfect bag that covers all usage scenarios. I'm sure I'm not the only photographer with more than one bag. As of this writing, I'm up to three. I have a Kata DR466 backpack that works well for times when I want to travel fairly light (one camera and a couple of lenses) with a notebook system or a portfolio binder. Another backpack, my Think Tank Streetwalker, is probably my favorite for general photo outings. It caries my DSLR, my micro 4/3 body, and a few lenses plus other odds and ends. I'll probably write more about those bags in the future. Today I wanted to discuss another option that I recently found. 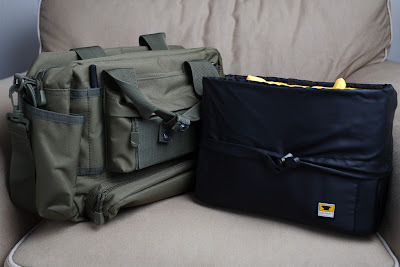 Why another camera bag? Well, the thought first came about when I bought my Olympus E-PL1 a while back. My other bags were overkill for this little camera and an extra lens or two. I wanted something smaller that would be easy to tote with me on a daily basis. Now, I'm really picky about bags. I tried out a bunch in all the area stores and left unsatisfied each time. The storage wasn't right or they just looked "wrong." A lot of the bags in the size I was looking for were just too purse-like. Can't have that. I started thinking about my shooting range bag. One of my other interests is competitive pistol, rifle, and shotgun shooting. My range bag is laid out perfectly for its usage with handy pockets all over the place to store the various things needed at the range. Why can't a camera bag be set up like that? Then it hit me. Off in the corner of my garage was a small tactical utility bag that I'd gotten for free with a promotion on some other stuff I bought for the range. It was about the size I was looking for, but it wasn't configured for camera usage. I knew I was on to something though. I took some measurements and after a little online research I found an insert that I thought would work. As luck would have it, one of the REI stores in town had the insert in stock. A quick trip to the store confirmed that I found a winning combination. The bag is called a bailout bag. 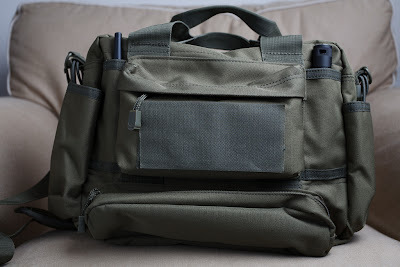 It's currently a popular tactical bag for police gear or a range bag for shooters. I've seen them sold under a variety of brands, but the best source is LA Police Gear. They usually have it on sale for $19.99 This bag is built tough. The cool thing is all the pockets on the outside. There are plenty of handy places to stash stuff. I use mine for quick access to a pen, flashlight, business cards, memory cards, flash drive, my glasses, a table top tripod, etc. There are also big end pockets, designed for police radios, that are perfect for water bottles. 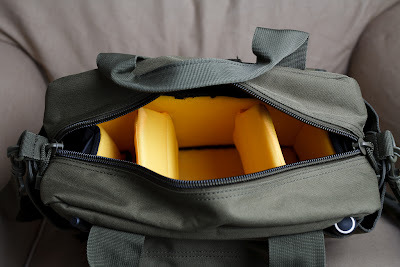 Rugged carry handles are on top and it comes with a sturdy strap with a nice no-slip shoulder pad. The bag measures approximately 14" x 10" x 6". To complete my camera bag, I chose an insert made by Mountainsmith. The insert is called a Kit Cube. I paid $29 for mine locally. I just folded the cover down on the outsides of the insert and stuffed it in the bailout bag. It fits a little snug, but it is just about the perfect size. There is plenty of clearance to zip up the bag over the insert. The insert comes with standard velcro attached dividers to break out the compartment into three sections. I usually keep it set up in three sections to carry my E-PL1 and a couple of extra lenses. With a little rearranging I can carry my DSLR and maybe an extra lens instead of the E-PL1. I've found that my DSLR with a prime lens will fit well with my E-PL1. 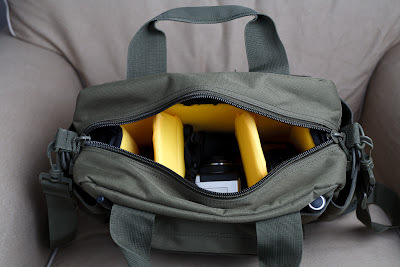 For about $50 you can build out a capable camera bag that is probably more rugged than a lot of dedicated camera bags on the market. 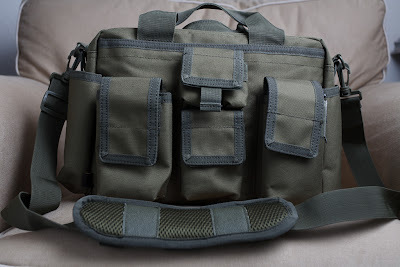 It has a utilitarian look that doesn't scream camera bag. The pocket layout is great for keeping the things you use most close at hand. I find it easy to carry every day during the work week so I've always got a camera with me. The small size means it fits well in my motorcycle's small trunk or saddle bags. 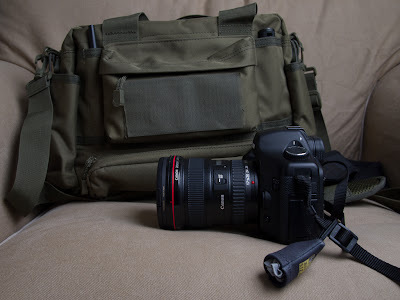 I'm happy with my choice and this is a setup well worth considering if you're looking for a way to tote a small camera rig.